Islamic art and culture is often perceived as an enigmatic phenomenon to outsiders, and perennially described as a new frontier for Western intellectuals. 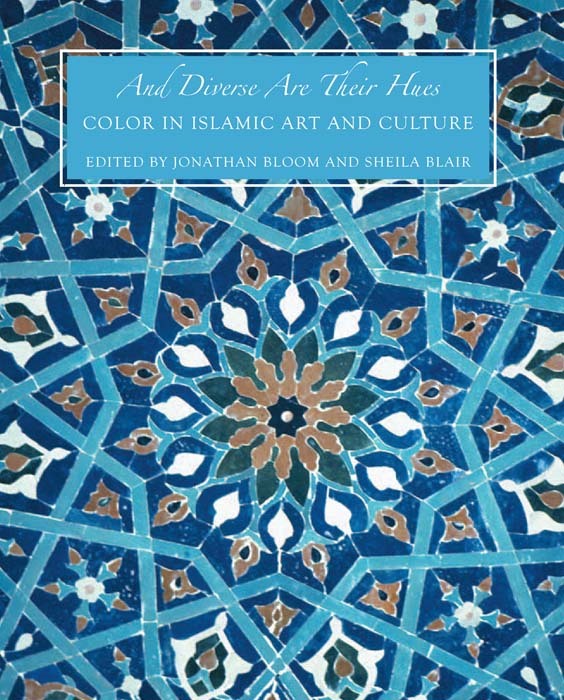 And Diverse are Their Hues: Color in Islamic Art and Culture was published by Yale University Press in October 2011. It is a collection of research papers focusing on the role of color in Islamic art and culture, presented by twelve distinguished scholars for the Hamad bin Khalifa Symposium, held in Cordoba (Spain) in 2009. Drs. Sheila Blair and Jonathan Bloom, the Hamad bin Khalifa Chairs of Islamic Art in Virginia Commonwealth University are the editors and the authors of the introduction to this impressive undertaking. To my great delight, this volume took my existing knowledge into new realms, encompassing a wide range of fascinating subjects. From the aesthetics of color in Islamic architecture, gardens and manuscripts, to the role of color in spiritualism and the quest for power and political legitimacy. These explorations also extended to include cross-cultural comparisons present in colonial Latin America. The introduction by Jonathan Bloom and Sheila Blair is a wonderful overview of the role of color in Islamic art and culture covering a wide spectrum of disciplines. Early on, we are presented with a poignant fact about the development of the vernacular of Islamic art history. Before the 1960s, those studying Islamic art and architecture in the West had to depend upon mostly black and white slides or faded photographs. According to Drs. Blair and Bloom, the convenient accessibility of black and white visual material caused scholars to concentrate and write more about form and design than color. How this has changed is revealed by exploring this book, as readers are taken on a vivid tour spanning fourteen centuries, featuring works from Lahore in present day Pakistan, on through the Arabian desert and across to Quito, Ecuador. The subject of color is presented as a cultural phenomenon, where different societies recognize colors according to their particular language and culture. These idiosyncrasies range from the number of colors identified in the rainbow to the modern scientific understanding of color in terms of depth, contrast, hue/saturation, and types of color mixing. Have you not seen how God sends down water from heaven, and therewith we bring forth fruits of diverse hues? And in the mountains are streaks white and red, of diverse hues, and pitchy black; men too and beasts and cattle - diverse are their hues. To understand how the Arabs of Muhammad's time perceived the colors of the world around them, they list the colors mentioned in the Koran - white, black, red, green and yellow - which were also the basic colors of pre-Islamic Arabic language. Along with the expansion of Islam and the Arabic culture, other elements such as local and regional traditions, and scientific knowledge gained from other civilizations were incorporated into Islamic culture, affecting the meanings associated with colors. 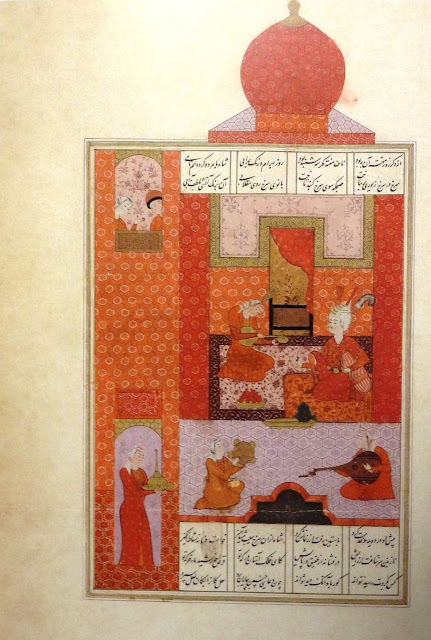 On a prosaic level, Nizami's poem is a bedazzling exploration of the pleasures of love, but it can also be interpreted metaphorically as exploring the seven stages of human life, the seven aspects of destiny, or the seven stages of the mystical path. - this is the guide provided by Najm al-Din Kubra (d. 1220) but his disciple's differing conception is also mentioned to state the conclusion that colors could mean whatever people wanted them to mean. They also touch upon the European notions of color and the effect these had on the Islamic theosophist al-Kirmani (d. 1870) who took up Goethe's theory of "physiological colors." Drs. Blair and Bloom state that artists and artisans must have had an entirely different experience of color through hands-on experience, not wholly validated in the theoretical notions of contemporary writers. From here, they explore the philosophy of color with its practical applications by artists as opposed to the theoretical approach of the philosophers, scientists, and mystics. Color in the arts of the Islamic lands is pursued further in the craft of making books involving the preparation of colored inks, dyeing leather and paper, calligraphic arts, conservators analyzing the pigments used in the multicolored manuscripts, and the trade and production of textiles and carpets. The coloring of fabrics was a very costly and an intriguing process. According to Drs. Blair and Bloom "for Muslims, the magical transformation wrought by the dyeing process of fabrics had religious overtones: observers knew that dyes were veils or vessels (which color the water according to their own hue) and that to change color meant also to change one's character." Even the color of the kiswa, cloth covering the Kaaba, changed with the caliph to bear that particular dynasty’s colors. 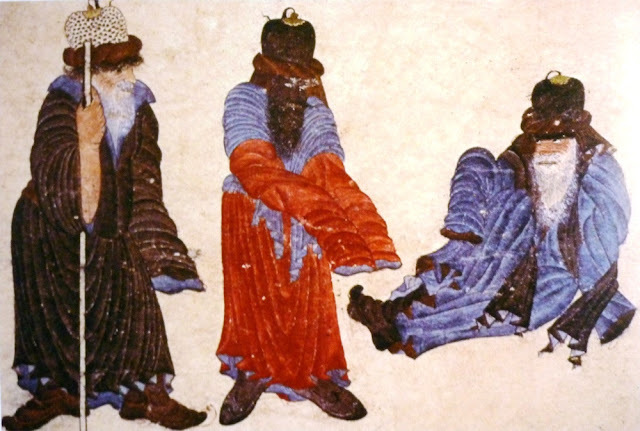 They note that materials used in the artifacts made in Islamic lands were also prized because of their inherent color. Color played a crucial role in the surface design of metal-works, enameling on metals and glass and especially the glazes used by potters. 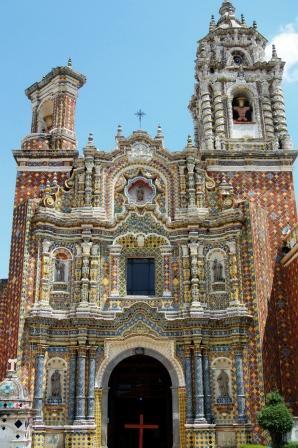 In architecture, colorful decorations in the form of tiles, glass mosaics or painted walls and ceilings were mostly to be found inside buildings. Regional differences were also noted. In India builders and patrons had used the natural red sandstone for their buildings. In Iran where the buff-colored brick did-not afford the same kind of opportunity, they were forced to incorporate colors in other ways like the colorful tile decorations. Finally, the passion for color was extended from the buildings to the lavishly colorful gardens in Islamic lands. Drs. Blair and Bloom conclude by adding that the colorful influence of Islamic art and culture was transported from Spain across the ocean to the New World in the form of colored tiles, decorated wooden ceilings and the ornamentation of doorways and windows. They also state that the preconceived notions of the Castilian encounter with Islam were carried over to the Spanish conquerors' perception of the New World. Each of the twelve papers delve into the significance of color approached from a variety of angles within the Islamic world. The relevance of the topics covered surpasses just a concentration in the Islamic world extending well into the art and culture of the West as well. The vibrant photographs included within the book complement the text beautifully; some of the photographs are especially precious since they are of places or object not frequently published . Overall this book is a valuable addition to any art or history scholar’s library. I would like to thank Yale University Press, Inbooks Australia and 3PP for the review copy. Sedef Piker is a graduate of F.I.T at New York State University. She has studied the complex forms of Tehzip (Ottoman Illuminated Calligraphy) at the Ministry of Culture’s Traditional Turkish Decorative Arts program in Topkapi Palace, participating in several group exhibitions including one at the National Library in Ankara and one at the Museum of Turkish and Islamic Art in Istanbul. She describes each experience in her life studying design and learning artistic technique being accompanied by a ''gnawing hunger for more knowledge'' of art and history, which she delights in exploring at Sedef's Corner and its accompanying twitter feed. Cheers for the comment Dogan and welcome to 3PP! Thank you to Sedef for this fascinating review - as the subject matter is so close to my own heritage I must admit that I can take its beauty and intricacy for granted sometimes. We can only imagine what the Islamic equivalent of painting would have looked like had it been an acceptable means communicating spiritual themes as in Christian art. It is also interesting to note how Islamic influences fed back into Renaissance art in Italy particularly - covered in the wonderful Hans Belting volume last year and observed in motifs such as pseudo-kufic script seen adorning the robes of holy figures. Fascinating! The connection between color and mystical states is especially intriguing. Fascinating indeed, and beautifully written and presented. Out of curiosity, were the seven colors of the seven pavilions those of the Vedic chakras? The area of robe colours and symbolism is so interesting - this post compliments Dr DeStefano's Color and Meaning post very nicely. The colours of Sufi spiritual advancement - black, white, blue and multi make instant sense - and are slightly easier to remember than the colours of Catholic liturgical significance! Thank you Hasan for inviting me to share this review that is a little removed from your usual sphere, it's a privilege to find such an enlightened platform. 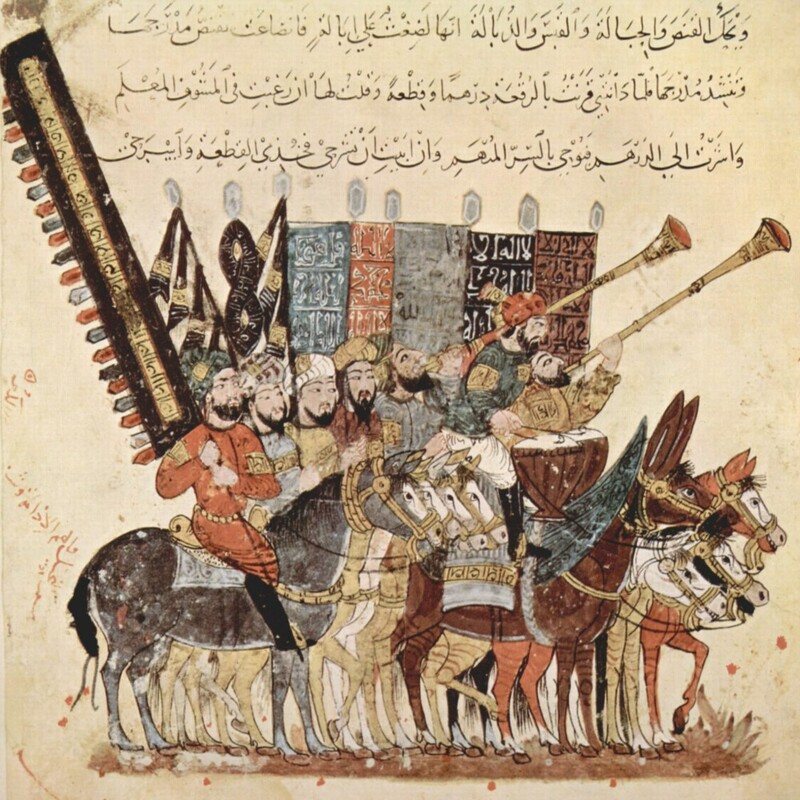 Also,the Islamic equivalent of painting communicating spiritual as well as secular themes can be found in the art of manuscript painting (miniatures) and illuminations. It is a visual language that is so far removed from the Eurocentric modes of representation that we tend to not classify it as such. If you are interested, my post in www.sedefscorner.com on Patronage and Secular Subject Matter in Islamic art covers most of these issues. Thanks for the clarification Sedef - I love how the days and colours also have a geographical element as well. @Glennis - all this makes me wonder what JRR Tolkien knew of colour symbolism from the east and west - his wizardly characters wore different colours in their different stages of wisdom/ability! Thanks, Sedef! This is all fascinating. To ask a probably simple-minded question: I always had the impression that green was "the color of Islam". When and how was that established (if it actually was)? This seems to be taken for granted in the discussions of the Spanish trade in emeralds from the New World--with most of the best ones going to Turkey and North Africa. @ Edward- Thank you for the inquiry. I will try to answer as best I can. According to Drs. 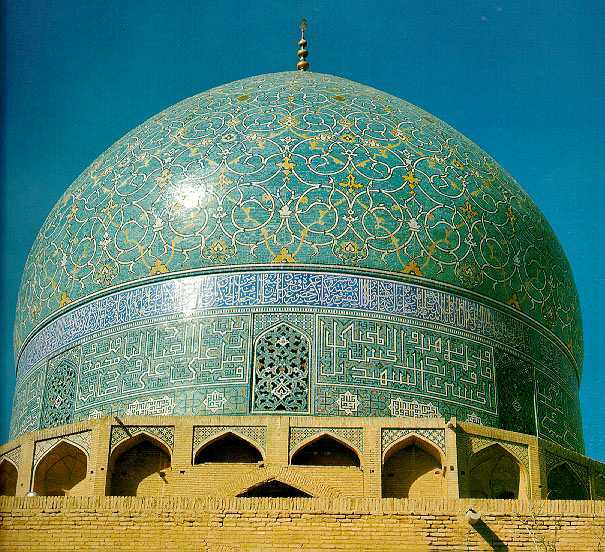 Blair and Bloom, the color green was supposed to be the mark of descent from the Prophet but the right of the sharif to wear a green turban was enunciated only in 1376 in Egypt during the reign of the Mamluks. The exploration of the role of color in Islamic art and culture is supposed to be very rare and the purpose of the symposium held in Cordoba and the papers presented. "...In 1614 when the Spanish monarch Philip III sent a diplomatic mission to the Persian shah with his ambassador bearing several hundred gifts, valued at more than 32,000 ducats, the most expensive item in the assemblage was five barrels of cochineal, worth 4,000 ducats according to Habsburg inventories, for making the finest crimson color." Taken in this context and with all the other information revealed in this book, I would venture to say that the geography and natural elements available probably had a lot to do with the predominant use of one color over another. I will inquire about the preference for emeralds in Ottoman period and will let you know if I find anything that might be relevant. What a great review, Sedef! I didn't know that the color of the kiswa changed depending on the caliph -- you've definitely left me wanting to know more! @ Edward - I found out there is a new book "IMPERIAL OTTOMAN JEWELLERY - READING HISTORY THROUGH JEWELLERY" that is due to come out at the end of April by Dr. Gul Irepoglu. She said that she did not come across a connection between the color green and a preference for emeralds by the Ottomans but I am sure her book will be very interesting. I agree with zanda's "Прекрасно!" - this is an absolutely beautiful article on an equally beautiful blog. Bookmarked for future reference and enjoyment :) . MashaAllah. This is a good review, I have a big interest to know more about that painting -maqamat al hariri. First time I saw that painting in a book titled, "Historical Atlas of The Islamic World" by Dr. David Nicolle. by reading your articles, I just know more about why the black color is used in kiswa.